Banbridge claimed the second EY Hockey League laurels as they held off a rampant Three Rock Rovers with a big win over Railway Union to land the title on goal difference on a dramatic final day of the regular season.Going into the final tie, Bann were level with Rovers on points but had six goals on goal difference in the tank.But any thoughts that it would be an easy buffer were quickly put to the test with news that Rovers had gone 3-0 up on Instonians in the first eight minutes of their tie at Grange Road.Bann, though, were in high-scoring form too with Fraser Mills netting two first half goals in addition to a penalty stroke for Matthew Bell before half-time. By that stage, Rovers had gone 6-0 up on Inst with Luke Madeley on course for a hat trick, halving their deficit.And the gap was down to two goals on goal difference by the end of the third quarter with Rovers 8-0 up and Bann 5-1 to the good against Railway as phones were frantically checked for updates from either end of the M1.Nerves were eased, though, when Ross Beattie added a sixth Bann goal while William Robinson fired in a consolation goal for Inst against Rovers that all but swung the balance Bann’s way.They closed out their 6-1 win with Rovers’ 9-1 result proving three shy in a thrilling end to a cracking campaign with precious little between the top two. Banbridge earn a return trip to the Euro Hockey League as a result.Both clubs go into the EY Champions Trophy next week with Bann facing Monkstown in their semi-final while Rovers play Lisnagarvey.Monkstown rubber-stamped their ticket with a 4-3 win over Garvey, Geoff Cole scoring the winner with two minutes to go.At the bottom, UCD will go into the relegation playoff after they let slip a half-time lead against Pembroke to lose 4-2. It meant that Railway Union – despite their heavy loss – stay in the top tier for another season.Glenanne closed out their campaign in seventh place with a third win in their last four games, beating Cork C of I 1-0 courtesy of Eddie O’Malley’s single goal.In the EYHL provincial playoffs, Annadale will return to the top tier thanks to their final victory over Cookstown, Peter Caruth inspiring a 3-1 win with Fergus Gibson, Craig Getty and Oli Brown on the mark. Banbridge produced the goals they needed to stay clear of Three Rock Rovers in dramatic fashion, managing to do enough to win the EY Hockey League title on goal difference on a day of frantic checking of phones between Havelock Park and Grange Road.At three quarter-time, Rovers looked like they could potentially close the gap fully before a strong late showing for Bann meant they kept the lead they had held for so long.Bann started strongly with a Fraser Mills effort on target early on for 1-0, this was followed by a Ross Beattie reverse which hit the side board. Railway were sitting deep trying to hit the home side on the counter attack.A great attack by Bruce McCandless set up the chance but Johnny McKee flicked just over. Then Matthew Allister sees his shot taken off the line, towards the end of the quarter Bann saw a Mathew Bell short corner flick hit the post.They added another couple in the second quarter when a Peter Brown pass found Mills who scored his second.Railway’s keeper Stephen O’Keefe was very busy but proving difficult to beat. Bann did win a penalty stroke; Matthew Bell sending O’Keefe the wrong way for 3-0 at the break while Rovers were 6-0 up on Instonians in Dublin, halving the goal difference deficit.The third quarter was a more even affair, but Bann continued to push for more goals. Brown was outstanding in midfield, winning possession and turning defence into attack. He was well supported by McCandless, Beattie and Sam Farson who put in great shifts but they did see Mark English pull a goal back from a corner for Railway to trim the gap.Bann soon won another short corner, a great switch at the top saw Eugene Magee send a rocket goal bound only for the defender to stop it illegally on the line. Bell coolly sent the keeper the wrong way again to make it 4-1 to Bann. Ross Beattie then finished well to make it 5-1 to re-strengthen their position.In the final quarter, Bann pushed for another goal with news from Grange Road that Three rock had scored again to make it 8-0. Railway were defending well as a team as they knew their EYHL league survival was on the line too. A great bit of play between Peter Brown and Fraser Mills on the left saw a cross put in and there was Eugene Magee at the back post to score the 6th goal and make it 6-1 to Bann. With the news that William Robinson had scored for Instonians in Dublin, Bann could finally breathe easier, getting them over the line for a memorable league victory. 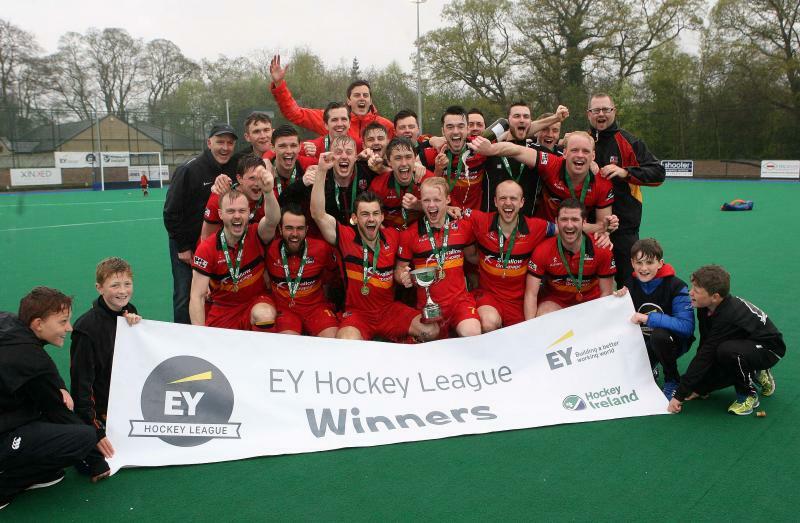 Three Rock Rovers hammered Instonians 9-1 at Grange Road in their final EY Hockey League game of the season but the result proved not quite enough for them to overhaul Banbridge, missing out on the title by three goals on goal difference. From the outset, they needed to outscore Bann by six goals and they got off to the perfect start with Mitch Darling scoring inside two minutes. Kevin Mullins forced home a second in the seventh minute and a Jody Hosking strike followed seconds later - a brilliant reverse stick effort - to build a 3-0 lead with just eight minutes gone. Luke Madeley's drag-flick accounted for the fourth goal before Conor Empey slammed in the fifth on the half-hour mark after the ball bounced fortuitously off umpire Robert Johnston. Another Madeley drag made it 6-0 at the break. All the while, goals were raining down at Banbridge, too, extending the Rovers' required goals which slowed up somewhat in the second half. Madeley completed his hat trick before Ross Canning coolly slotted home from close range for 8-0 by the end of the third quarter. At this stage, 11 goals was the target but the killer blow to Rovers' title hopes arrived when William Robinson scored from Inst's only corner. Mullins grabbed a second goal with time running out but Rovers ended three goals short of Banbridge, ending with an 11th successive win but second place on goal difference. UCD let a half-time lead slip against Pembroke to see them fall into the EY Promotion-Relegation playoff game, setting up a repeat of last year’s game against Cookstown at the same stage of the playoffs.Goals from Jeremy Duncan and Andy Keane had them in good shape before Pembroke struck three times after the break for the victory. Throughout Pembroke had to thank Ingram for several last man saves, making a first key intervention from Duncan on the reverse in the 12th minute.UCD scored in the 15th minute through Andrew Keane to make it 1-0 slightly against the run of play with Jack Ryan, Alan Sothern, Andrew Shekleton and Patrick Good all having efforts on goal.Ryan did get them level in the 18th minute from a corner rebound but UCD went back in front as half-time closed in. It came from a Pembroke corner that was cleared quickly, leading to a corner at the far end. Duncan deflected home for 2-1.The second half, though, saw Pembroke find a greater efficiency in front of goal. In the 41st minute, David Quinn showed how it should be done for a blistering reverse which flew into the UCD net, past his namesake Conor, to equalise the scores 2-2. Quinn again was prominent from midfield and, in the 57th minute, he drove along the end line and his strong cross took a deflection off De Boe Agnew and nestled in the UCD net to give Pembroke the lead for the first time in the match. There were more excellent saves by Ingram in the 61st and 62nd minutes as Pembroke were exposed by lofted balls. But, in the 65th minute, Ryan got his second goal on the reverse which flashed past Quinn in the UCD goals to make the game safe. Monkstown rubber-stamped their place in the EY Champions Trophy playoffs with a 4-3 win over Lisnagarvey at Comber Road with Geoff Cole grabbing the winner two minutes from time,Davy Carson’s snap-shot from close range gave Town a seventh minute lead which Timmy Cockram countered from a corner in first quarter stoppage time.It remained that way through to a mad-cap final quarter in which Williamson put Garvey in front before Carson nabbed his second for 2-2. Matteo Romoli restored Monsktown’s lead with mere minutes to go only for Cockram to tie things once again. Cole, though, had the deciding vote with his second goal of the week for a 4-3 success. Glenanne closed out their season in fine fashion, running up a third win in their last four games to end in seventh place overall as Eddie O’Malley’s single goal made the difference at St Mark’s.After battling the rest of their province to get to Dublin, with a Munster exodus to the Aviva Stadium, the C of I squad arrived in Glenanne after a tortuous four and a half hour drive. Both teams started promisingly but found the pitch very dry and not conducive to flowing hockey, leading to something of a stalemate. C of I worked hard to press Glenanne while the hosts aimed to play on the counter but both defences held firm to half-time.The Glens stepped up right from the start of the 2nd half and won a number of corners with Shane O’Donoghue firing wide of the left upright. The deadlock was broken from another corner when the ball was switched left to Sam O’Connor who flashed a pass left of the keeper for a deft finish from O’Malley. C of I tried hard to get back into the game and, with Glenanne shipping a couple of cards, they created a number of openings but found Leo Micklem unbeatable, making a number of fine saves to deny an equaliser. Back to full complement, the next goal looked more likely to come from Glenanne with a number of counter attacks being squandered. The final chance of the game came fell to C of I right on the final whistle but a goalward looping ball was picked out of the air by Joe Brennan for the win.